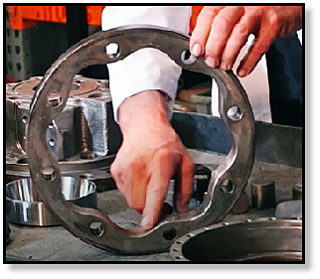 Hydraulic contamination is a major source of problems for any type of hydraulic system, but especially for hydraulic motors and final drives -- which means that it is very important to be well informed on the subject. In this Shop Talk Blog post, we are going to talk about the types and sources of contamination, as well as how to avoid contamination. This information is important for all types of hydraulic construction equipment, from a Terex CTL to a Bobcat skid steer. There are several different types of hydraulic contamination. Some forms of hydraulic contamination can be seen with the naked eye and are usually in the form of particles. Slivers of metal or flakes or rust can be easy to spot in hydraulic fluid, and form the type of contamination that most filters can remove from the system. For example, in the image shown you can see brass particles on the inside of the cover plate from a hydraulic motor (which is never a good thing). Brass and metal shavings are usually generated contamination. As the name implies, generated contamination is "generated" by the final drive. A certain amount of generated contamination is expect as the result of normal wear and tear. Another type of contamination is the presence of water or air in the hydraulic fluid. Water can cause the fluid to appear milky, and air tends to make the hydraulic fluid look frothy. Both of these can cause severe damage to the hydraulic system, including cavitation and erosion. There are other forms of contamination that can’t necessarily be seen with the naked eye, however. This can result from the natural breakdown of the hydraulic fluid and its additives over time, or can result from chemical reactions between the fluid and the presence of water. The best way to deal with the effects of chemical breakdown and reactions is to drain the hydraulic fluid and replace with fresh, filtered fluid. There are many potential sources of contamination. 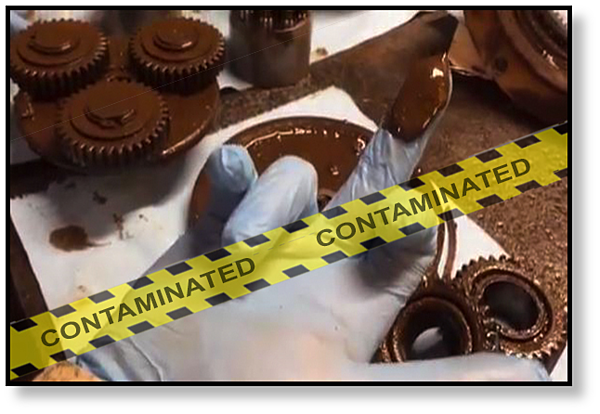 Contamination can be introduced while the hydraulic equipment is being manufactured. This includes particles of sand left over from a casting process, a string from a piece of rag used to wipe a component down before it was installed, a small glob of grease, or even a tiny bit of Teflon tape. These would be considered contaminants and could cause significant harm to a hydraulic motor if not properly filtered. Many people do not realize that hydraulic fluid arrives contaminated. Manufacturers do not always have complete control of how the fluid is stored and shipped, so for optimum machine performance experts recommend that hydraulic fluid be filtered before it is added to the system. In addition, different types of hydraulic fluid should not be mixed. Reactions can occur between the additives that can seriously compromise the performance of the hydraulic fluid and damage your system. Contamination can be introduced when hydraulic equipment is being serviced, especially if it is serviced in the field. The exterior of the equipment should always be cleaned before it is serviced (you'll notice what thoroughly clean the exterior of hydraulic motors before beginning the disassembly step). Be especially careful when removing hoses, taking care not to allow debris to access either the ports or the hoses. Hoses and ports should be plugged immediately. Hydraulic fluid should be stored in sealed containers away from fluctuating temperatures. Fluctuations in temperature can allow air to permeate the container and contaminate the fluid. Furthermore, any time a container is opened, it should not remain open any longer than necessary. Not only could particle contaminants make their way in, but the fluid might also absorb water or air. Another option, especially for larger fleets of equipment, is to have the hydraulic fluid analyzed for the presence of contaminants, including chemical contaminants. When it comes to preventing damage to your final drive from hydraulic contamination, the key is to check and change the case drain filter. Most hydraulic motors have a case drain line and filter. 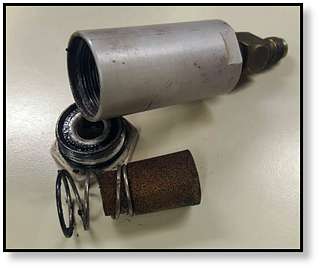 If that filter becomes clogged, excessive pressure builds up in the hydraulic motor and can result in catastrophic damage. 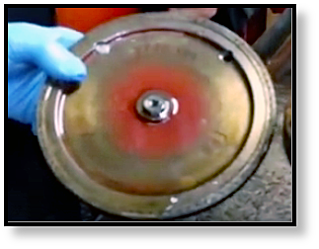 Contamination can cause result in something wrong with your final drive. Again, this can be avoided by checking and changing the case drain filter on a regular basis. All hydraulic systems are susceptible to damage from contamination, but especially hydraulic motors and final drives. In fact, newer machines seem to be even more sensitive to hydraulic contamination. Radial piston motors, for example, can suffer irreparable damage to the cam ring if abrasive particles are not filtered out of the system. 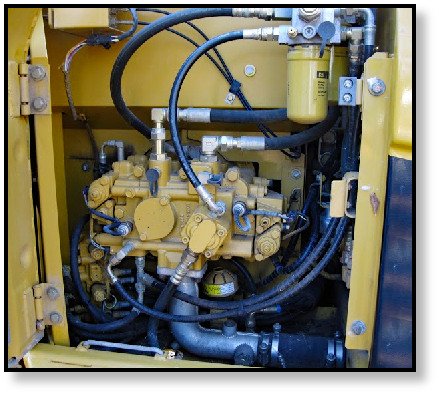 The key to keeping your hydraulic equipment free of contaminant damage is to filter the hydraulic fluid before it goes into the system, drain and replace the hydraulic fluid regularly, check and change the filters and breathers, and only open up the hydraulic system in a clean environment. When excavators track drives do fail and it's time to replace the final drive motor do your research. Explore best-in-class reman track drive motors from the Texas Final Drive Store. Looking for your reman Terex Compact Track Loader hydraulic drive motor, check out the latest in inventory.